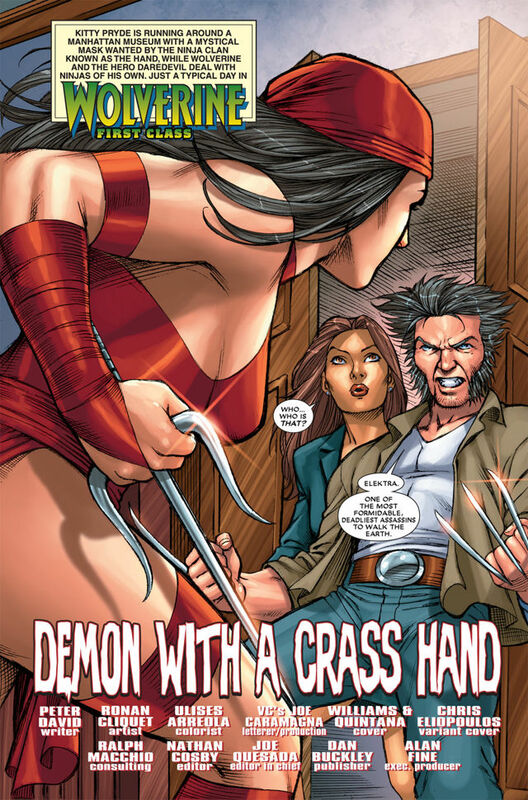 Issue opens with Elektra standing in front of Wolverine and Kitty Pryde. The two assassins stare each other down and jump towards each other. Turns out, they were only posturing, and they have a load of mutual respect for each other. Kitty can’t believe that Wolverine knows an assassin. 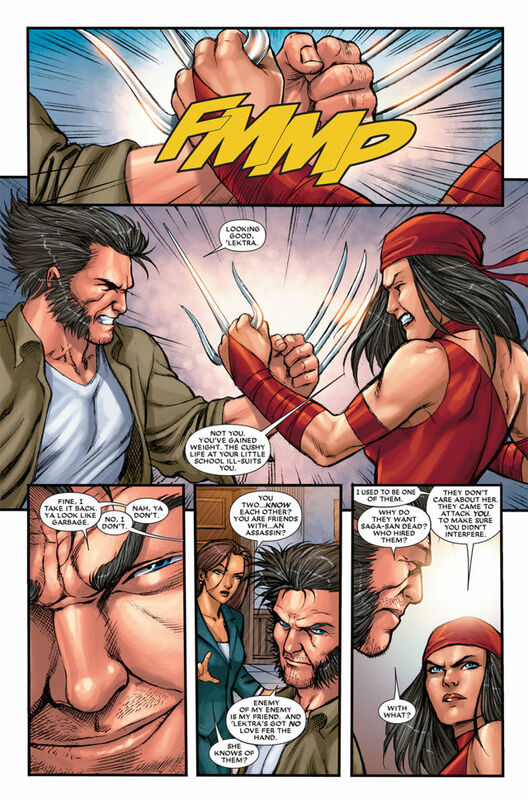 Elektra is an enemy of the Hand and the Hand is an enemy of Wolverine’s, so an enemy of my enemy is my friend. Elektra tells Kitty that she use to be a member of the Hand. Last issue, while at a museum, Kitty was attacked the Hand with the issue’s guest star was Daredevil. That was Peter David’s gimmick for his run on this title, to have a third hero appear in the title. Kitty grabs the mask that the Hand is after and she phases through all of them. Elektra is gong to assist them on the way out. Elektra refers to Kitty as having a husband and now I am not sure if the lady in the blue isn’t Kitty. Okay, I read along and the brunette above is not Kitty but the wife of the former owner of the mask. Kitty is running around with the mask and trying to avoid the Hand. Having two young brunettes wearing blue jackets, probably wasn’t the greatest idea. I guess I shouldn’t include the above images but that is okay. They work to illustrate my point about how that could have easily been Kitty, on first sight. Elektra reveals that the mask isn’t just a demon mask, it is a demon in a mask. A few floors down. Daredevil is an awesome s-word on s-word fight. Wolverine, Elektra and the third lady get to an elevator. Wolverine doesn’t smell any ninjas and the broad doesn’t understand what he means by, smell. Kitty is still running about when a giant explosion occurs. Outside, Six Seconds Ago . . . Kitty’s friend, Sarah, is outside, waiting for Kitty to catch up to her when the explosion occurs. There is a double page ad for the X-Men Trilogy being on Blu-Ray, for the first time. Which I may have to buckle down and buy one of these days. Kitty wakes up and Sarah is standing over her and she is holding the mask. Daredevil gets thrown through a window, floors above them. The ninja that was fighting him jumps out of the window but before he can strike, Elektra kicks him in the back. Sarah is freaking out, a bit and the mask is telling her to place it on her face. 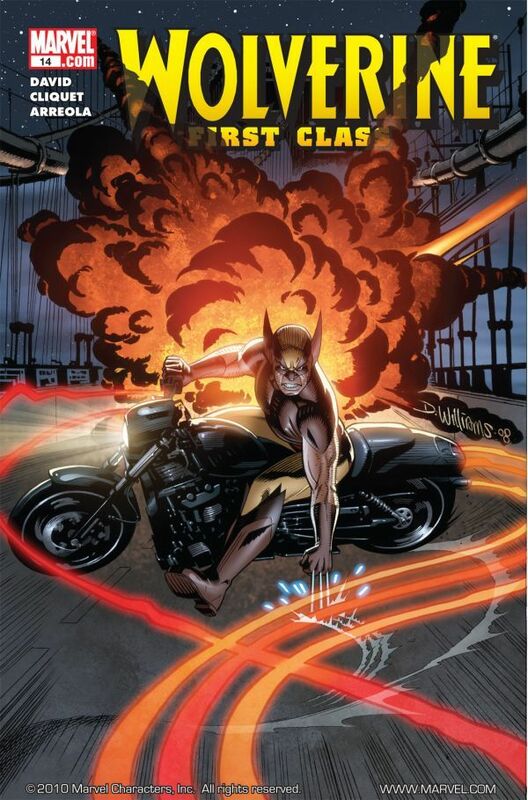 Wolverine shouts that she shouldn’t put on the mask – who would? Of course she does and the demon comes to life, the demon’s name is, Shinigami. Wolverine wants to attack the demon like a young lady isn’t inside of it but Kitty tells him that isn’t going to work for her. The leader of this squad of Hand, and who has been fighting Daredevil, his name is, Akuma. As he is wasting time giving his name to the demon, the demon kills him. I really thought that the red mask was going to lead to Ogun but it didn’t go in that direction. Elektra instructs that everyone should attack the mask portion of his face. The demon is about to fly off when Daredevil snatches his leg with his billy club. Daredevil meekly asks for help and Elektra & Wolverine, each grab a leg. The combined weight brings the demon down. Kitty sneaks up behind and phases his hand through the head and the mask comes off. As the mask is in midair, Wolverine dices the mask. Kitty helps Sarah to her feet and comforts her. Issue ends with Wolverine thinking he forgot something and that something is the lady in the elevator. Someone will come to her aid, eventually. Next issue guest stars, Thor! Which I have reviewed already.